Do you just trim back a gardenia bush or can you cut it back very short? I don't want to destroy the plant. It is taking over the area where it is planted. 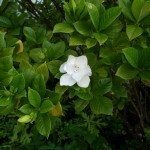 You can cut back gardenias by 1/3 per year. Any more than this and you could kill the plant.